Most heavy goods vehicles over 7.5 tonnes are banned from the French road and motorway network every weekend between the hours of 10 p.m Saturday and 10 p.m Sunday. There are exceptions for trucks carrying perishable produce or refrigerated produce, trucks servicing sporting events or trade fairs, and a few other cases. HGV's are also banned on public holidays, normally from 10 p.m the night before, until 10 p.m on the holiday itself. The two big summer public holidays in France are 14th July and 15th August. When these public holidays fall on a Saturday or Sunday, Lorries are banned 24/24. This means that trucks cannot transit via the inner ring road of Paris (boulevard pï¿½riphï¿½rique) during these hours. There are also extra weekend lorry bans on Alpine motorways in February - though given the traffic jams that are possible here at the time, these routes are best avoided by anyone not needing to use them - lorries or cars, ban or no ban. After three years of shilly-shallying, the French government has finally capitulated to protests by French and notably Breton truck drivers, and abandoned (at enormous cost) the "Ecotax" that should have come into effect on all main French non-toll dual carriageway routes. Pending a decision on what to do with them, the ecotax gantries straddling main French non-toll highways are currently standing idle. Meanwhile, more and more local authorities are banning transit by HGVS over 7.5 tonnes from sections of main road where there is an alternative motorway route available. There are two classes of tolls for HGVs : Class 3 tolls apply to lorries with two axels; class 4 tolls apply to vehicles with more than two axels - notably articulated trucks and semitrailers. Check out here for toll costs on principal routes through France. Check out these pages for no-tolls routes to southwest France and no-tolls routes to Provence. There are a number of secure HGV parking areas on French motorways. Some are on service areas, others are a few hundred metres from the motorway. These areas provide secure lit parking for trucks 24/24 and 7/7, and are manned by security staff and watched closed-circuit TV cameras. A2 Valenciennes, exit 20 (Between Paris & Brussels) Off motorway park with 300 spaces. A 16 exit 48 near Calais Transmarck Polley secured lorry park. Off motorway, 210 spaces. A 16 exit 48 near Calais All4Trucks secured lorry park. Off motorway, 150 ->300 spaces. A 31 Junction 6, Langres south (between Reims and Dijon or Nancy & Dijon) Private off-motorway park. A 43 L'Ile d'Abeau North service area, between Chambery and Lyon, Lyon direction only. A 9 Lunel interchange. Near Nimes between Avignon and Montpellier 149 spaces. A mine of information about Paris, including attractions, Paris hotels, transport, and lots more. 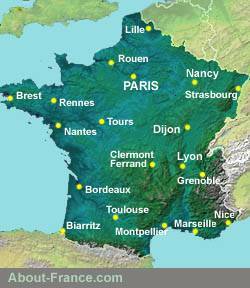 Plenty of very useful Information on things to do before starting your trip to France. All about life and living in France, including working in France, food and wine, education, shopping.